We interrupt our Summer School Series for some good ‘ol fashioned outdoor play—and because there happens to be two seriously awesome new picture books about riding a two wheeler (the Ultimate Summer Challenge, really). The first book is for the I-Think-I-Can-Beginners; the second is for the experienced, daring, and creative bikers (especially those with a love for all things Space). Lug ten tons of second-hand steel to park, at the request of eager child. Help eager child up into bike seat. After much cajoling and pleading and promising for the 45th time that you are going to hold on the whole time, convince child to remount bike and begin pedaling forward. After 10 minutes, whereby you are still holding fast to the training-wheeled bike and said bike has moved exactly 10 feet, suggest that he try turning. Feel an abrupt jerk as child slams on the breaks (this, oddly, comes very naturally), jumps off bike, and announces that he is Most Definitely Not Doing This Right Now. Lug ten tons of steel back home. Fortunately, Everyone Can Learn to Ride a Bicycle paints a much rosier picture of a child learning to ride a bike, along with the help of her patient and gently encouraging father. Rashchka’s signature watercolors, seemingly effortlessly executed with thick, breezy, rough strokes of paint, are perfectly suited to the subject at hand. Every single painting exudes movement—whether it’s the little girl pulling her father’s hand toward the bike shop, her sideways and backwards tumbles off the bike, the neighborhood kids zooming past her on their colorful two wheelers, or her triumphant forward-leaning fast-pedaling stance at the end. Rashchka’s greatest gift has always been his ability to capture emotional expression with just a few brushstrokes; and it’s the determination, bewilderment, frustration, joy, and pride on the little girl’s face that will make this gem relatable for children—those struggling to ride and those who’ve newly mastered the skill. 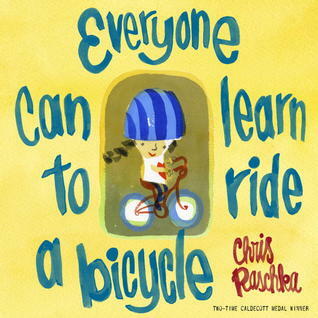 I’m not promising this book will work miracles, assuming there might be other parents out there who are having similar bicycling battles on the playground (please tell me I am not alone); but I can promise that your child will identify a kindred spirit on the page. Moving on to mor e advanced bicycling (and a longer, more sophisticated story), I fervently recommend How to Bicycle to the Moon to Plant Sunflowers: A Simple but Brilliant Plan in 24 Easy Steps, by Mordicai Gerstein (Ages 5-10). If the irreverent title alone hasn’t sold you, let me sing the praises of this most entertaining book, particularly for the kid who loves science, invention, numbers, the Moon, and bossing people around (that would be my son to a T, minus the bicycling). First, when was the last time your child read a work of fiction that was laid out in steps? Each of this book’s 39 pages outlines a different step, numbered 1 through 24, many of them sub-categorized with letters (12a, 12b, 12c, 12d, etc.). Kids love this stuff; it’s exactly the way their mind works when they are bossing us around. Gerstein’s pen and ink drawings have a comic-book feel, but the crudely colored line art is mixed with grace and subtlety (the Moon’s changing expressions are a particular delight). This is the same Gerstein who wrote and illustrated one of my (and my son’s) favorite books: The Man Who Walked Between the Towers (Ages 4-8), the true and serious story of Phillipe Petit’s dramatic tightrope walk between the World Trade Towers in 1974. The two books could not look or feel more different (a rare feat for a picture book artist); yet, oddly, they both involve moving atop a skinny, rope-like material suspended over great heights. Gerstein writes books about dreams—about the mystery, wonder, and excitement in planning for and achieving those dreams. I have a dream that my children will both ride two wheelers some day, that they will taste the victory that comes from balancing up high on their own, and (as I vividly remember doing as a young girl) that they’ll speed around the block, dreaming and scheming and making their own Big Plans. You are currently browsing entries tagged with bicycling at What to Read to Your Kids.